Alexa's publisher who is annoyed when she decides to end her successful Mystery Man series. He argues with her at first and tries to change her mind but, when she threatens to find another publisher, he instantly revokes his earlier pleas and agrees to end the series. He meets The Doctor twice: once alone when The Doctor claims to be Alexa's father, and a second time in the finale when they finally put him straight. He appears in Alexa Foster: Mystery Woman and then again, in The Good, The Bad And The TARDIS. Jenna is Alexa's best friend and confidante. After she visits the publisher, Alexa meet her for a coffee in the town where she proceeds to tell her about her decision. Jenna is initially hesitant about the idea but, later supports her friend and admits "it's a very tactical decision but, it works". While out shopping after her meeting with Alexa, Jenna is apprehended by two Sontarans dressed in their full suits of armour. With the Sontarans promising to release her as soon as The Doctor shows up, it seems it's up to The Doctor and Alexa save her before time runs out. Jenna finds herself attracted to The Doctor and admits to Alexa that her "new fella is really dishy" and asks if she can have his number to which Alexa responds that "he doesn't really have one" but, Jenna believes she's lying so she can keep him all to herself. Jenna appears in Alexa Foster: Mystery Woman, The Human Robot, Plastic Fantastic and The Good, The Bad And The TARDIS. Commander Draghl is the leader of Seventh Sontaran Battalion. He despises The Doctor and Alexa, branding them both "disgusting creations of the universe". Draghl is tough with his battalion but, is regularly out-ranked by General Stark which gives him much humiliation. Nevertheless, he is well-respected and his fleet always obey his orders. He is often seen taunting The Doctor about his past relations with their species and soon grows a strange attraction to Alexa, which sees him kidnapping her (or in his words: "rescuing her") and taking her back to Sontar. When The Doctor locates them, he warns Draghl that the next time they meet, he would make sure he was the first to die. After their encounter, Draghl brands The Doctor as his "greatest enemy" and promises to dispose of him in the very near future. Draghl appears in Alexa Foster: Mystery Woman and The Good, The Bad And The TARDIS. General Stark is Draghl's superior. He continually undermines him at every action but, Stark seems oblivious. 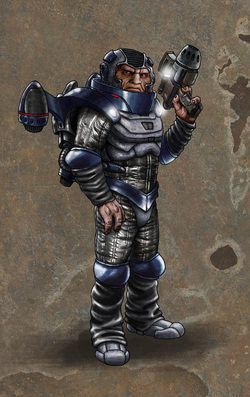 Stark is a survivor of the war between the Sontarans and another species known as the Rutans. He is both physically and mentally scarred from his time fighting in the war and this sometimes effects his leadership. At one point, Stark goes AWOL and Draghl and The Doctor must work together to find him and bring him back home to Sontar. Once he is found, he is ordered to remain out of action until he is deemed fit enough to return.